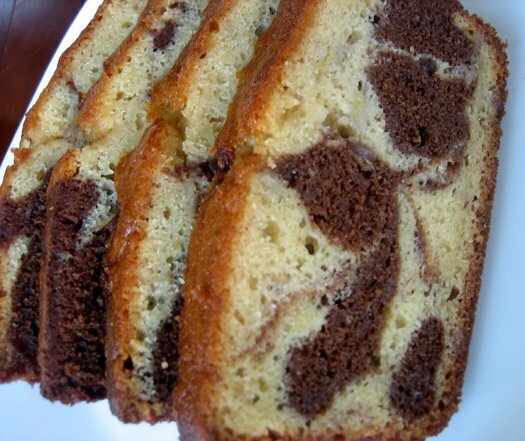 Bananas and chocolate in a dense, moist bread. You really can’t go wrong with that combination, and this bread did not disappoint. My friend Amber and I were looking for something to bake together and since she is now the proud owner of Dorie Greenspan’s Baking: From My Home to Yours , we picked this recipe from her book. I have such fun baking along with others, as it’s a great time to talk my way through a recipe as it’s developing with someone else. 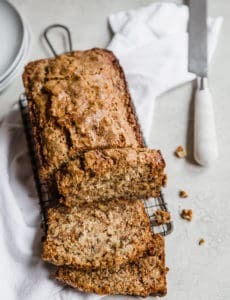 I was excited about this recipe, as it’s been quite some time since I’ve made a banana bread, and I was also on the hunt for a chocolate fix. This bread satisfied both of my cravings, and I couldn’t stop taking little pieces as I walked in and out of the kitchen. Dying to try this one (since ALL of your recipes are incredible!). Can I omit the rum? I don’t have any extract or run around right now and would like to make today! Hi Nicole, Yes, you can omit the rum. If I were to try and make it into muffins, what temp/time would you recommend? Hi Crystal, Definitely! Use the same temperature, but reduce the time. I would start checking around 18 minutes or so to be sure you don’t overbake. Thanks for getting back to me! I know this recipe’s been up for a while. It yields 18 regular size muffins (as opposed to the tiny or giant ones) and took about 45 minutes to bake at 325 degrees. I also left out the rum, lemon juice and zest. I didn’t have any chocolate, so I substituted 3 tablespoons cocoa powder and 1 tablespoon butter for EACH of the THREE ounces of chocolate called for. I made this recipe today. 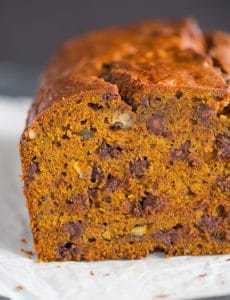 Very easy, moist and delicious!!! Good for any time of the day….. I made this tonight and it turned out great, except I didn’t love the flavor of the lemon in there. I was very hesitant to put the zest and juice in to begin with, but I like to stick with the recipe the first time I make something. Next time I would substitute the lemon juice and zest with a couple tablespoons of buttermilk, to get the moisture and tang without the lemon flavor! I’m going to try this one tonight!!! Yes, definitely. Enjoy the bread! 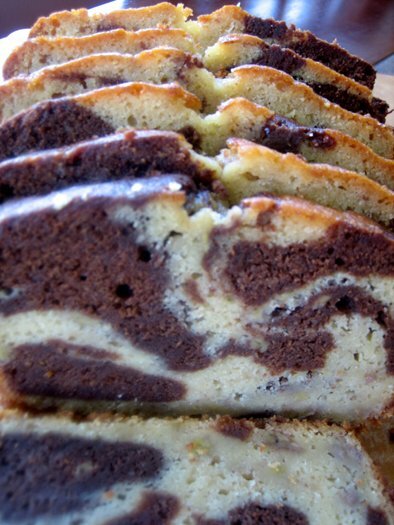 Truth be told, I could skip the marbling and the chocolate all together! *gasp* I thought that just as a banana pound cake this would be to die for! 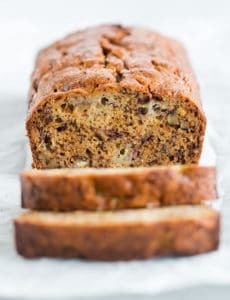 It’s definitely got a different consistency than you standard banana nut bread. My man sampler approved. He approved it warm right out of the oven. He approved it as a dessert. He also approved it as breakfast, smothered in P.B. It was a hit! Your loaf is beautiful. Great Marbling!! I am sure it was as tasty as sit looks. Your marbling is just perfect! wow, it’s beautiful. You did a wonderful job with the marbling. This totally reminds me of my mom. The dessert she’s most known for is her 20 lb cake, a mix of chocolate and vanilla pound cake. And then there’s always her chocolate chip banana bread. This is a combo of both! Peanut butter! Now why didn’t I think of that? I bet it would be great on the cake. Love your marbling. Thanks for cyber-baking with me, it was great fun! Your swirls look fantastic. Looks great – just like Dorie’s! this looks so good. i’ve been dying to try this since i got my copy of the cookbook. looks beautiful! LOL-this is the TWD pick this week. :) Good choice, it was tasty. Wow, it looks GORGEOUS and sounds delicious. I have got to try this one! Chelley, I am totally going to make this. I love the look of the marbling. Totally yum girl! Dh would love the addition of the pb, good suggestion! I liked this bread too- I’ll be posting it tomorrow along with a couple hundred other people :) Marbling is fun to do- yours looks very pretty. I think that between banana bread and a pound cake is a good description. I thought it would be more like bread, but I liked that it was more like a pound cake. Beautiful bread! Looks awesome and the addition of rum sounds great!